R10000-PXWS is rated 4.9 out of 5 by 8. Rated 5 out of 5 by Kjack from Perfect for remodel This was perfect for our bathroom remodel. We updated shower fixtures and Delta makes it very easy with this. Rated 5 out of 5 by KJ from Fits perfect Fit perfect. Was very happy that it was available with pecans connections. Thx!! Rated 5 out of 5 by Katie from Universal with service stops This is a great alternative valve to the traditional Universal valve because of the service stops. Being able to shut off the water at the valve and do work on it is essential, why wouldn’t you pick this one? For a few extra dollars you buy a lot of piece of mind. Rated 5 out of 5 by AuntSheShe from Shower Upgrade This product was purchased while upgrading my shower. Delta always stand behind their product. All products are a great value! Will always purchase Delta in the future!! 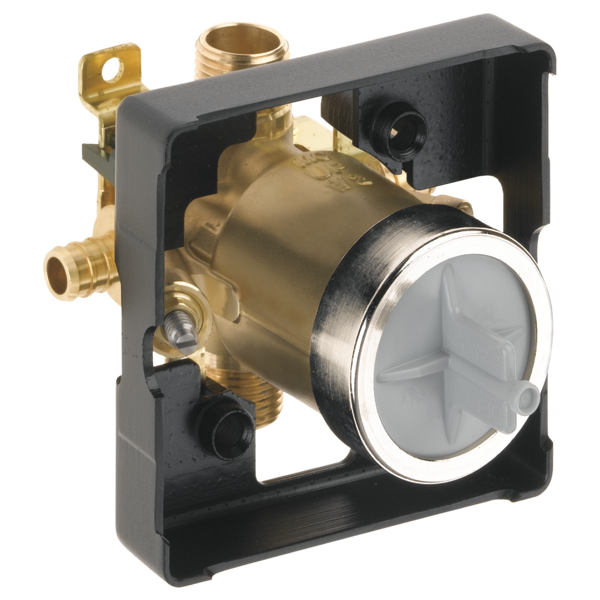 Rated 5 out of 5 by amateurbuilder from good product This valve is easy to install, has numerous trim options for any decor. Can you tell me which cartridge is used with the multichoice R10000-pxws valve? I just cap off the tub output and I am good to go? PEX from valve to showerhead? I know you recommend copper from the valve to the tub sprout because of shower rise. Does it matter if I run PEX from the valve to showhead? Do you recommend either copper or PEX for best performance or does it simply not matter? Building a shower using this valve. want to use 4 Body sprays- D50150SS on one 17T valve. I'm concerned about flow/pressure if 7gpm at 60 psi. the Delta sprays are rated 2 gpm each. I don't yet know street pressure. if 60 psi, will this work? 70 psi? I have purchased one of these valves and want to use a trim kit by another maker. Is this valve compatible with other faucet makers? Do valve cartidges usually come with the trim kits? I am replacing a 10+ years 1400 series old valve body in which I sheared off (poorly designed as seen in middle picture) the 3 copper pipes connecting the valve body frame to the cartridge receptor drum, while trying to replace the RP19804 cartridge due to dripping shower head. I bought the R10000-UNBX, as although all my pipes are PEX, I also would need elbow and outlet fittings anyway to reach my current pipe locations. This is installed opposite the showerhead wall, in a knee-wall topped with glass enclosure, so the top outlet was capped off, and the shower was fed from the bottom outlet (as seen in 1st and 3rd pictures). The old valve had a few inches of copper pipe before the PEX connection (1st &amp; 3rd pic). I also notice the RP10000 instructions mention the tub outlet (which I am using for shower only) drop pipe must be 8-18 inches copper only. Is this initial copper length only required for the pull-diverter mechanism from bath-spout to shower, or is it still required in my application and why, or can I connect my PEX directly to the bottom outlet using an NPT-PEX adapter? Why not have a PEX crimp port on the top port to the shower spout? &nbsp;This would eliminate using an adapter. What am I missing?